Starting over again - Egg Rolls. Starting my Baking adventures, Again. A year ago, I joined, with big expectations and little patience. I decided to make a loaf, it suprisingly worked out really well. 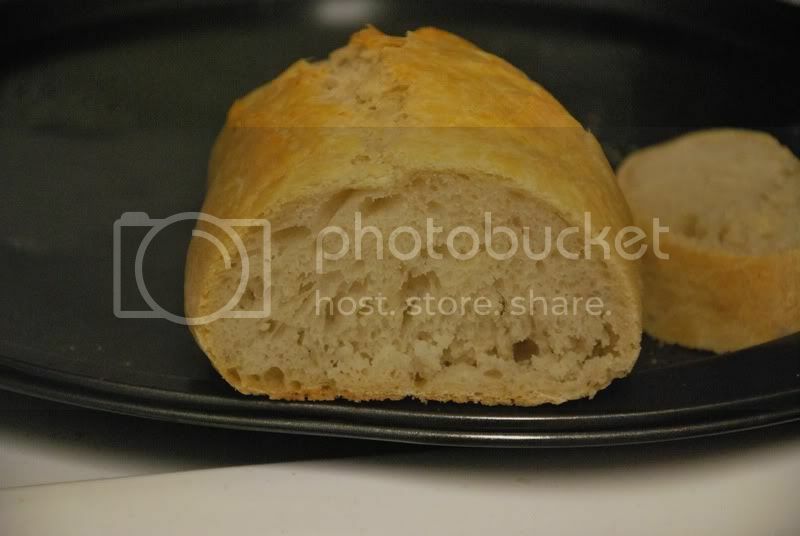 Then, I decided to make my own sourdough loaf/starter. So today, I start again. This morning, I mixed some (1/2 cup) flour, pinch of salt, Yeast, and water . Wisked it into a batter (pancake batter consistancy) and then put it in the fridge. Tonight, I'll try and tackle egg rolls! I'm hoping to put the egg yolks (2) into the dough (2 of them) and then glaze it with the egg whites. Sound like a plan? Anyone have a simple egg roll recipe? I want very "airy" loafs with some good flavour, which is why I made the starter this morning. I do not have a mixer. Just the good 'ol hands or a wooden spoon my mom used to chase me with when I was a kid. I'm looking at a kitchenaide Pro 5? series - the 525 watt motor. I've read that the 325 watt motor has trouble getting through larger/thicker doughs. Well... they didn't turn out great. Not a disaster, but I won't be serving them to guests, Sadly. I won't have time tomorrow to bake more, so Off to the grocery store I go. 3 cups flour, 1.5 teaspoons instant yeast, about 1/2 teaspoon of salt, Milk to bring to a thick dough (nearly unmixable) Then I added two egg Yolks and then water to "sticky" dough. I stirred it with a wooden spoon in a pyrex bowl, let it sit for 45 minutes. Didn't grow much. I then dusted the counter with flour and kneaded for 10-15 minutes. It turned into a somewhat smooth consistancy, but was still fairly sticky. I put into a soup bowl and it rose a bit. (grew about 1.5 inches in height. 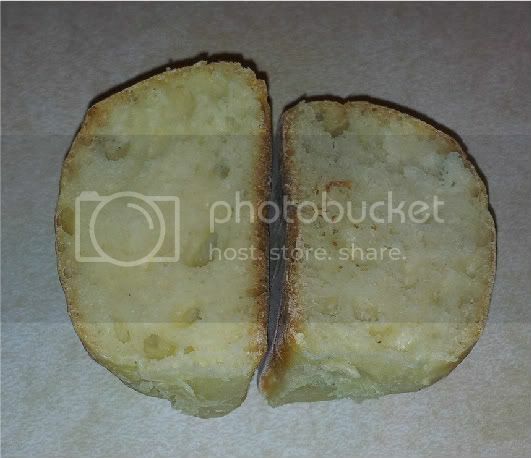 I kneaded again for a few minutes, then put it in the bowl, covered it with suran wrap and put it into a slightly warm oven (maybe 80*f) 45 minutes later, I brought it out, "shaped" it (I need work on that!) and then cut off small peices with a pizza cutter. I tried to "round" them but they kinda sprung back to their orginal form. I let them sit on my cooking sheet for about 15 minutes and threw them in the oven after glazing them with egg whites. I set the oven for 400*f, and when I threw in the rolls, I also threw in 250ml of water, straight into the bottom of the stove. Nice steam cloud, it didn't evaporate all the water instantly, it took about 2-3 minutes for it all to go. The end result... will come soon. My phone is being silly and not letting me e-mail a photo. They don't taste good. Like... they don't taste OFF, but Just... blah. Super bland. I thought letting the starter sit in the fridge would give it some good flavour, but the starter looked very inactive when I got home 8 hours later. *shrugs* I'll try again when I'm going to be home for an evening again. "... starter looked very inactive when I got home 8 hours later." Sounds normal for this type of pre-ferment. I am calling it that so we don't get confused with sourdough culture starters, often referred to as just "starters." Once flour and water are combined there is a process of decomposition going on. Mother nature wants to reclaim the minerals and organic matter returning it to the earth. Adding yeast speeds up this process. We bread enthusiasts take advantage of the beginning of this process and make bread from the flour trapping the gasses that collect from the fermentation of the flour. We bake it and violla! Bread. Simple huh? Well, maybe not so, and then again yes, it is simple. The trick is not to let the flour decompose too far before we use it or risk trying to put together a stringy mass. That's the tricky part. So let me explain the poolish. We take flour and water and speed up the fermenting process with a little added yeast. Let it sit, it ferments and gives off aromas and takes on flavours and all the time the gluten (protein bonds) that formed after the first 10 -45 minutes or so is slowly stretching and inflating with by products of CO2 gas from fermentation. 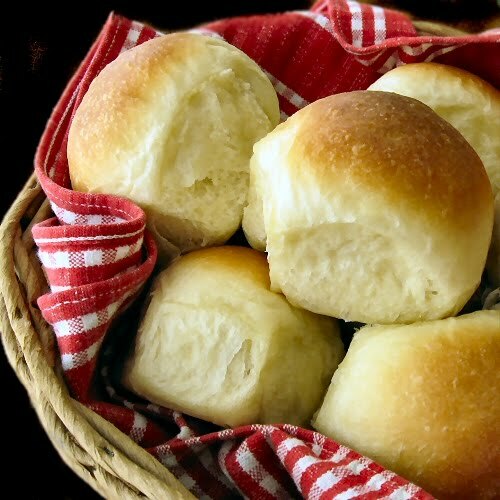 When the yeasts have used up the available "food" in the flour, the acid level in the dough rises and switches off the whole yeast-making-gas activity. The acids then break down the dough structure. What we do is stop the process before the acid builds up to distructive levels and combine this poolish with more liquids and flour and make our bread dough. Now you know the process, lets jump to the recipe I just posted. There is discussion following the recipe and I hope it answers many Q's you might have. Posted are discussions over scalding the milk or heating up to frothing around the edges (not boiling) to kill certain enzymes before using in bread. This will also help the bread texture. Try and see. Salt is usually between 1.6% and 3% of the flour weight. Meaning for ever 125g cup of flour, about 2.5g or 1/2 teaspoon table salt is needed for 2% salt content. That might help you understand why the buns were so flat tasting. You can adjust up or down with your tastes, I tend to use just a little bit less, closer to 1.8% salt. Thanks for the info! For some reason I've always been "afraid" of salt. I thought I Read that it inhibits the yeast, and I was looking for a very light, fluffy bread. No point in having fluffy if it tastes bad! I'll add more salt. How do I get a more "fluffy" bread roll? As well, I was hoping for that "yellow" color of Egg Bread, However, Nowhere even close. I'm guessing now that bakeries must use food coloring? can also come from naturally golden colored wheat. But your guess is probably right. Important to have very yellow eggs if you want it to color the dough. Summer butter will also make a rich dough yellow. Saffron too. Carrot juice? 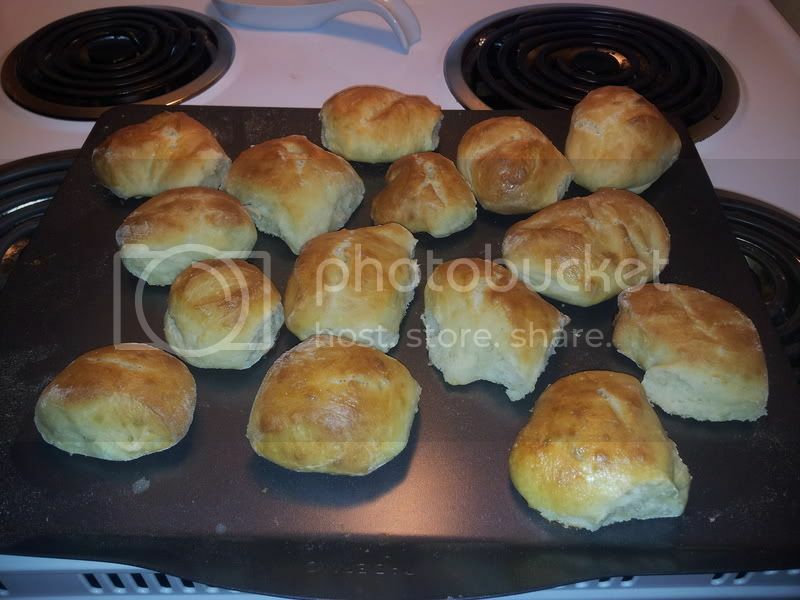 Floyd's Sweet potato rolls on the front page make very yellow rolls and good too. I've made them with squash. Fluffy? Use the search box in the upper left corner. Type in fluffy bread and see what shows up. Salted dough will also rise higher than unsalted. In case you wanted to know. About the only way you can inhibit yeast with salt to the point of being afraid to do so, is to mix the salt with the yeast and only a little bit of water. That might zap the yeast if you take too long to add any other ingredients. Salt helps control the fermentation. Without it, fermentation can be rapid and irregular and not predictable. Yes yeast in direct contact with concentrated salt but nothing else when it "wakes up" may die. But it's very easy to avoid this, for example just by mixing the yeast with the flour before adding any liquid, or with a bread machine putting in the salt, and then the flour, and then the yeast (so the salt and yeast aren't right next to each other). And yes salt in the dough will slow down the yeast activity a little. But with typical amounts of salt, the effect is more like needing put on a sweater in a cool house than like having it snow indoors. In fact, you can use the effect to your advantage, for example including salt in a "soaker" so you don't get runaway fermentation in the refrigerator overnight. You've understood the direction of the effect correctly, but the amount of the effect is far far lower than what should inspire fear.